Everyone wants to ride it. No one knows quite what to do with it. The strange and wonderful afterlife of a senior art project. Sam had faced doubts early on, as some faculty members were concerned that there just wasn’t enough time for him to pull off a project of this scale. But Sam had a habit of making his own path. Before coming to Pomona, he spent a year racing on an amateur cycling team in Spain, building his confidence and riding ability. At Pomona, the art major became fascinated with fungi—yes, fungi—after attending an environmental talk, and he took a year off to work in a science lab at the University of Minnesota back home. He returned to Pomona determined to meld art and science by crafting his own bike-driven mobile biology lab, which he did, eventually riding the 130-lb. “Velolab” to Los Angeles and back in a 50-mile trek. Simply put: Sam can. “We live for teaching Sam Starrs,” says Art Professor Michael O’Malley, who helped guide Sam along the way. But Circulus was bigger and more ambitious than any of his previous undertakings. 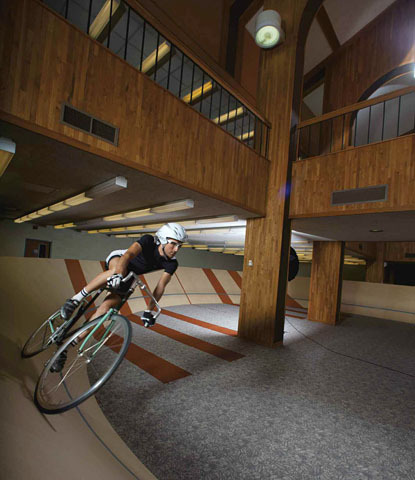 While Sam was fairly certain he could get the velodrome built in time, he worried over whether it would actually be rideable in the tight circle required for it to fit in Seeley- Mudd. His 3-D computer design and scale model would help reduce the risk of failure, but this was no sure thing until he put tire rubber to wood. So there was joy and relief as he made the inaugural ride with friends gathered around to watch. Thanks to centrifugal force—or was it something more?—he had no trouble taking a spin on Circulus without taking a spill. “I just rode around yelling and screaming and everyone was dancing around the side of it,” recalls Sam, speaking in his halting, soft-spoken manner that suggests that even as he talks a portion of his mental RAM is still devoted to making plans or poring over diagrams. Sam knew he couldn’t hold onto Circulus. And when he decided to give up the ring, its power only grew. DAN POWELL SPENT A CHUNK of his childhood amidst metal coffee cans full of bearings and axles as he worked on bikes with his old man. His dad had made a hobby of pulling jalopy bikes from the garbage and fixing them up. “No one stole your bike,” Powell recalls of those days. “Because they looked horrible.” But Powell caught the bike bug and went on to work at a series of bike shops and then at Planet Bike, a well-known bike accessories brand. For a time he lived out of his 1964 Ford Econoline van while working as an intern for Bike magazine in San Juan Capistrano, Calif. In 2008, he and business partner Erik Olson started their own bike-accessories business, Portland Design Works, in the cycling-crazed Oregon city. Powell dates his fascination with velodromes back to around 1995, when a couple of guys he knew who had been bicycle messengers told him about an event in Toronto with an insane figure-eight velodrome, complete with elevated flyover, called the Human-Powered Roller Coaster. Powell was transfixed by the blurry video. “As a very impressionable 19 to 20-year-old cycling kid, it seemed like the most badass thing ever,” he says. From then on, Powell recalls, he carried hopes of having his own velodrome. Fifteen years later, in 2010, he read in the Urban Velo blog that Sam Starr was trying to sell Circulus. Here was his chance. When Powell didn’t hear back from Sam, he figured someone had already swooped in and bought it. But Sam was still in France and just hard to reach, and Circulus remained in storage. When they finally connected, Powell recalled that Sam had mentioned online that he would be happy to get back half of the $3,000 that had gone into the project. Powell offered $1,600, which he had to borrow from friends, and the deal was sealed. In time, he boarded a plane for Southern California and rented a truck to bring Circulus to Oregon. Buzz about the velodrome’s arrival built quickly in Portland, and Powell and company invited friends to ride at a gathering that fell on April Fool’s Day 2011. They planned for a bigger unveiling, with a big party set for summer. They shored up the track,—which, after all, had been intended as an art piece—adding bolts and wood reinforcement. But they tinkered too much by brushing on a coating of basketball court varnish, leaving the track too slippery to ride just before the party. “We were panicked,” recalls Powell. Some skateboarders saved the day by letting them in on a trick: coating the track with a solution of watered down Coca-Cola would give it more stick and less slick. On went the show, which included a deejay and drew about 400 people, a cross-section of the biking community— “road cyclists, track guys, BMX kids.” The success of the event “kind of validated buying it,” says Powell. “It was an art installation because of its context in the library,” he says. 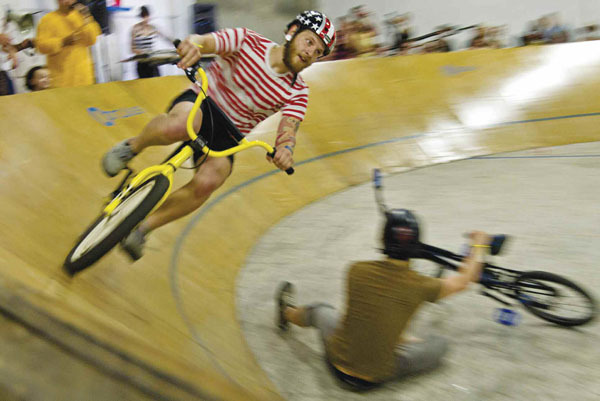 “You’re taking something and putting it … where it doesn’t really belong.” Then he turns a tad mystical: When Circulus became part of the bike world, Sam says, “in a way it was going home again.” But Circulus wouldn’t find a permanent home in that Portland warehouse. The velodrome was going on the road. The show went on and so did the races, sometimes strangely. One was between riders in Gumby and Pokey costumes, another costumed race pitted a hot dog against a squirrel. All in all, Circulus was a crowd-pleaser as expected. (Sam Starr had tried to make it back to the states to see Circulus in Vegas, but he just couldn’t pull it off.) Still, Powell, glad there were no mishaps, was relieved when the time came to disassemble Circulus. The ring, in some ways, had become a burden. Sure, it had brought lots of publicity to his enterprise in Portland, but he and his partner also didn’t want to be known just as the guys with the velodrome. Practically speaking, Circulus took up a lot of space they needed in their warehouse, and set-up and tear-down to take it on the road took hours of crew work—six hours to put it together, four to take it apart. “My wife was like, ‘It’s time for it to go.’ My partner was like, ‘It’s time for it to go.’ I knew it was time for it to go,” recalls Powell. So Circulus would be passed along once again. Powell had a good sense of who the ring should go to next. POWELL HAD CRASHED at his buddy Jeff Frane’s place last year when he came to Minneapolis for the Frostbike trade show. Frane was one of the first people Powell told about buying the velodrome, and Frane had fanned interest by unveiling the news in his Bike Jerks blog and posting the original video. “That was the spark in the proverbial dry grass,” says Powell. Frane has organized a slew of races in Minneapolis, another bike-crazy metropolis, including the annual All City Championship. “In short,” Frane writes online of his cycling interest, “I am way into it.” Like Powell, Frane also lived out of his van for a time. That was after college, where he’d studied comparative religion and public relations. “Super useful,” Frane says. Once again like Powell, Frane found a way to make his living in the bike business, in his case as the sales and marketing manager for All-City Cycles. The difference is that little All-City is owned by industry powerhouse Quality Bicycle Products. Circulus was handed off in hopes that a big enterprise would be able to do more with the bulky attraction. Frane talks of bringing Circulus to Midwestern cities such as Chicago or Milwaukee this summer. He’d like to take it back to Vegas for Interbike in the fall, and maybe add a twist, throwing out the idea of a circus tent or a fog machine: “I think there’s a number of ways we could take it.” But there are logistics to be worked out and expenses to be calculated, and, at the moment, Circulus is safely stowed away at QBP’s massive warehouse in Ogden, Utah. Says Frane: “It’s sitting there while we decide what the heck to do with the thing.” The ring rests—for now. Its maker, though, is hard at work. Sam Starr finally made his way back to the states, landing in little Hudson, New York. With some inspiration from art professor O’Malley, he took up another audacious industrial undertaking. Sam set to work on building a brick pizza oven … in the back of a truck. “To a large extent it’s just another excuse to get myself wrapped up in another crazy fabrication project,” he says. He recently started selling pizza out of the oven-bearing behemoth. (The business is called Truck Pizza: http://www.truckpizza.net./) But Sam remains an avid cyclist. He is still fascinated with velodromes and continues to field inquiries from would-be imitators requesting copies of the 3-D design he used for Circulus, though nobody ever seems to follow through and build one. “Maybe I should go into the mini-velodrome business one day,” he muses. Yes, Sam is tempted by the thought of forging another ring. “It’s in the back of my mind for sure,’’ he says.